ELECTRIC BOILING PANS There are 15 products. Bargain electric boiling pans. The great quality at the best price. Electric Boiling Pan with capacity of 80 litres , indirect heat. Heat in this boiling pan is created by high pressure steam generated in installed evaporator inside. As a result, steam is heating up the whole volume of the boiler not just a bottom. This technique makes our boiling pans perfect for cooking jams, soups, chutneys or just simply water. Reaching the boiling point - 80-90min. Electric Boiling Pan with capacity of 100 litres, indirect heat. Heat in this boiling pan is created by high pressure steam generated in installed evaporator inside. As a result, steam is heating up the whole volume of the boiler not just a bottom. This technique makes our boiling pans perfect for cooking jams, soups, chutneys or just simply water. Reaching the boiling point - 80-90min. 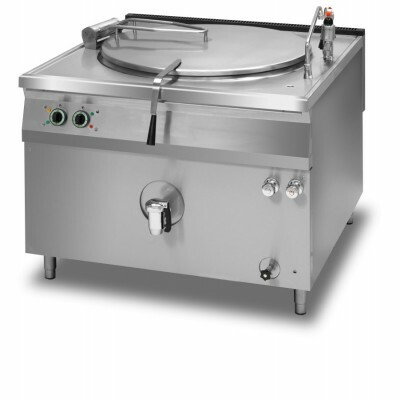 Electric Boiling Pan with capacity of 200 litres, indirect heat. Heat in this boiling pan is created by high pressure steam generated in installed evaporator inside. As a result, steam is heating up the whole volume of the boiler not just a bottom. This technique makes our boiling pans perfect for cooking jams, soups, chutneys or just simply water. Reaching the boiling point - 80-90min. 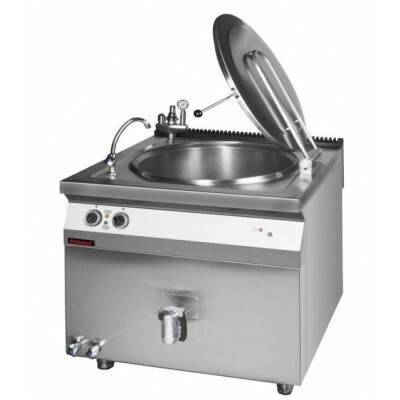 Stainless steel construction, double jacket system protects food from burning and equal heat distribution. Controlled jacket temperature, cooked liquid temperature and internal product temperature ie. joint of meat or sausages.Watter connection and draining valve as standard. Sealed cover. Single phase - hard wired with 40A fuse. Stainless steel construction, double jacket system protects food from burning and equal heat distribution. Controlled jacket temperature, cooked liquid temperature and internal product temperature ie. joint of meat or sausages.Watter connection and draining valve as standard. Sealed cover. 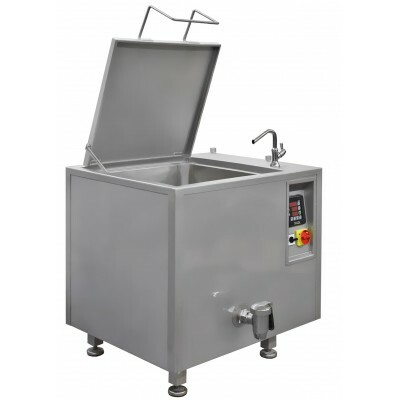 Electric Boiling Pan with capacity of 250 litres, indirect heat. Heat in this boiling pan is created by high pressure steam generated in installed evaporator inside. As a result, steam is heating up the whole volume of the boiler not just a bottom. This technique makes our boiling pans perfect for cooking jams, soups, chutneys or just simply water. Reaching the boiling point - 80-90min. 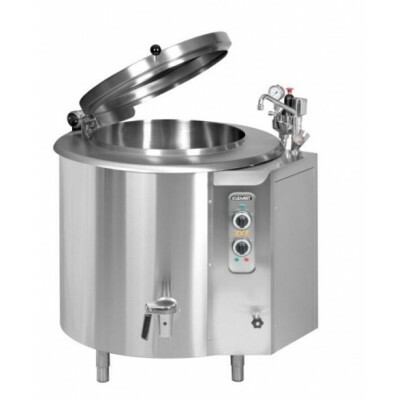 Electric Boiling Pan with capacity of 250 ltr, indirect heat. Heat in this boiling pan is created by high pressure steam generated in installed evaporator inside. As a result, steam is heating up the whole volume of the boiler not just a bottom. This technique makes our boiling pans perfect for cooking jams, soups, chutneys or just simply water. Reaching the boiling point - 80-90min. 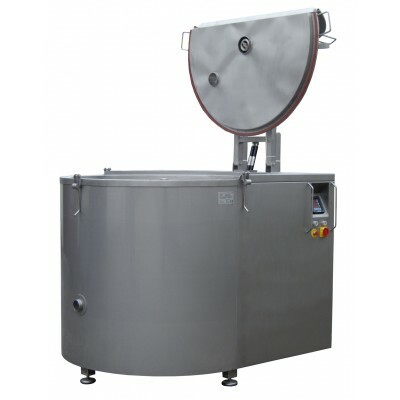 Electric Boiling Pan with capacity of 300 ltr, indirect heat. Heat in this boiling pan is created by high pressure steam generated in installed evaporator inside. As a result, steam is heating up the whole volume of the boiler not just a bottom. This technique makes our boiling pans perfect for cooking jams, soups, chutneys or just simply water. Reaching the boiling point - 80-90min. 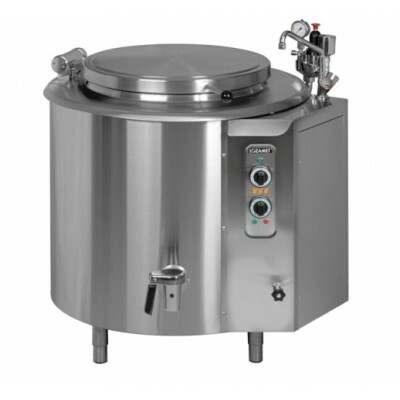 Electric Boiling Pan with capacity of 300 litres, indirect heat. Heat in this boiling pan is created by high pressure steam generated in installed evaporator inside. As a result, steam is heating up the whole volume of the boiler not just a bottom. This technique makes our boiling pans perfect for cooking jams, soups, chutneys or just simply water. Reaching the boiling point - 80-90min. 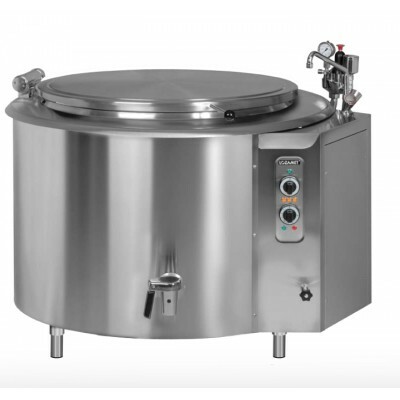 Electric Boiling Pan with capacity of 350 litres, indirect heat. Heat in this boiling pan is created by high pressure steam generated in installed evaporator inside. As a result, steam is heating up the whole volume of the boiler not just a bottom. This technique makes our boiling pans perfect for cooking jams, soups, chutneys or just simply water. Reaching the boiling point - 80-90min.